What you will learn from this white paper? Capacity Analysis. - Current State & Future State Forecast. Creating schedules and sequence timing to minimize set-up and changeover time. Typically a CAD layout, either 2D or 3D, will be imported into the model to ensure proper distance calculations. Then, processes, connections/conveyors, travel paths, and other defined data will be input into the model. Models are built graphically, without the need to write code. This is an important distinction between traditional and dynamic simulation® environments. Defining schedules, sequences, processes, etc... can be driven by distributions, but more importantly and in vastly every manner it has the ability to interact in real-time with external data sources to pull product mix, routing, and any other relevant data to the model from existing ERP systems, bar code systems, etc... Utilizing historical data delivers upwards of 98% accuracy, while at the same time delivering an apple to apples comparison of current and future state with proposed changes. This proactive forecasting allows the user to see projected scenarios based on actual collected data. The user has the ability to interact with the model while it is still running, saving time and providing feedback immediately. The user can then utilize this information to better understand possible outcomes, advantages and disadvantages to changes, and ultimately select the most logical, efficient, feasible and economically advantageous course of action. 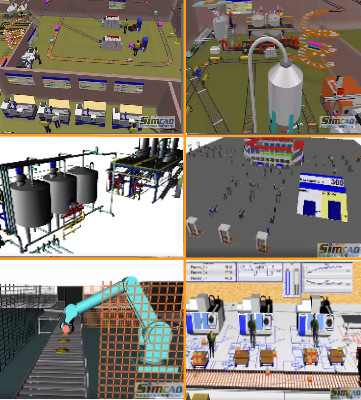 Integrated optimization, analysis, 2D and 3D visualization, along with the ability to create the model or virtual environment all without writing code make Simcad Pro's dynamic simulation® environment the perfect solution for a company’s manufacturing optimization needs. Do I have to stop the model every time I want to make a change? Can you show me how, with a fresh model? With the economy as it is and funds being more closely scrutinized before authorized to spend, it is imperative you understand the advantageous and capabilities of a system before making a purchase. Simcad Pro's patented dynamic simulation® engine delivers unmatched technology to users looking to identify, analyze and optimize manufacturing operations. View additional videos of manufacturing modeling, simulation and optimization. Optimize Production, forecasting and scheduling, WIP inventory, lean analysis.